1. 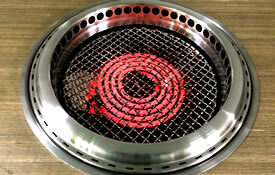 Shinpo was the first in the world to develop a smokeless grill that is durable with high heat. 2. The simple mechanism with fewer parts makes the grill easier to clean and transport. The grills are safe to operate. 3. 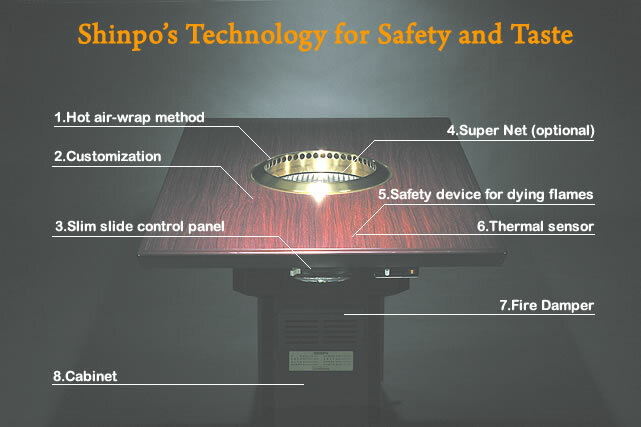 Shinpo grills are certified by major safety certification programs around the world. 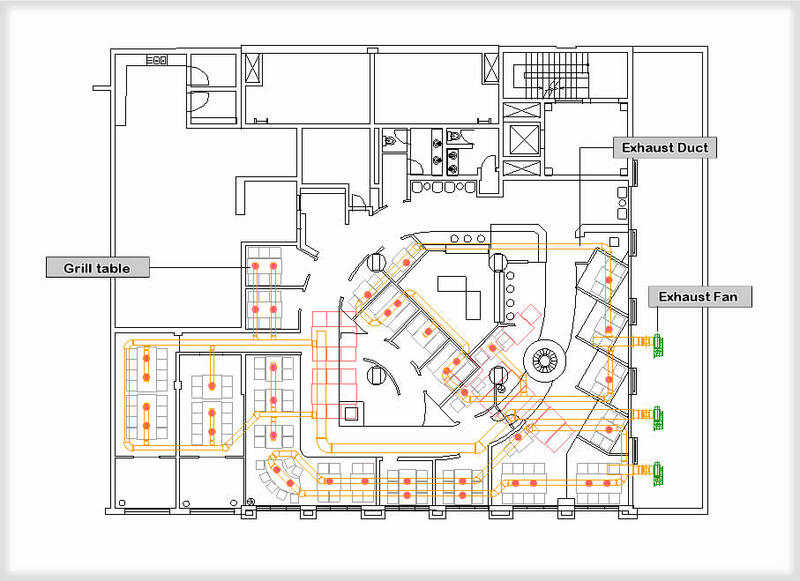 This is advantageous in obtaining building permits and purchasing fire insurance policies. 4. Shinpo grills are used in 16,000 restaurants in Japan and 700 eateries around the world. Gas only. This model cooks food items thorougly using radiant heat of the hot plate and is widely used to grill Yakiniku, steak, and seafood. Cooks by laminar air flowing around food items. Table-top size, color, edge designs and others can be customized to match a customer's restauant interior. 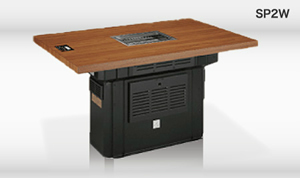 A 20 mm thin control panel design permits easy and free access to the control unit and minimizes obstructions under the table. The ultimate net with the features of both a net grill and an iron grill. An ultra-violet sensor detects flames. Gas is automatically shut off in the event of any failure on the burner flame. A buzzer goes off when the temperature of the main body of the unit becomes higher than normal and the gas is automatically shut off. This closes the lid automatically to prevent fire from getting into the exhaust duct. A slim design with a 28 cm width that ensures structual strength with rib angle. Food is cooked by hot air circulating around it and will not get dried out. Food stays delicious and juicy. Exhaust temperature is reduced by sucking up floor air from the slit in the Top Ring to supress a rise of grill temperrature and grease on the inner surface of grill. Cleaning is easy and safety is improved. Exhaust temperature is reduced to approximately 50 degrees from the conventional 70 degrees by sucking up floor air from the slit in the top ring to mix with heat from the grilling surface. Furthermore, safety is improved. Safety device for dying flames: A thermocouple detects heat from the flame. Gas is automatically shut off in the event of any failure on the burner flame. Fire Damper: This closes the lid automatically to prevent fire from getting into the exhaust duct. Guests may frequently reach for the control panels, including adjusting the heat. Shinpo has drastically downsized this important but troublesome device. With a thickness of just two centimeters, it is the thinnest in the industry, and is not a bother for guests to use. The gauge is designed to be easy to see so that guests can make minute heat adjustments. This is Shinpo's unique technology that allows guests to enjoy their dining experience. Fatty grease on the Outer Casing is reduced by 80% through the creation of an air curtain with fresh air. Easy to care for. the Inner Drain can be removed and put back easily. Shinpo products in North America meet ETL specifications. Please contact Shinpo directly for details. Please order your models except W series. 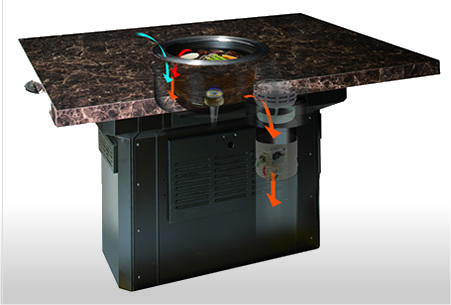 Unless exhaust volume, static pressure, and air speed of the grill table are adjusted appropriately in accordance with restaurant, food items will become dehydrated and there will be a large loss in cooling. 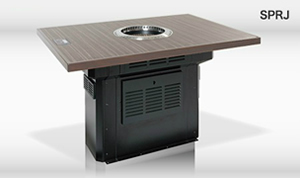 Shinpo proposes exhaust duct design perceiving smokeless grill ventilation and cooling as one unit. 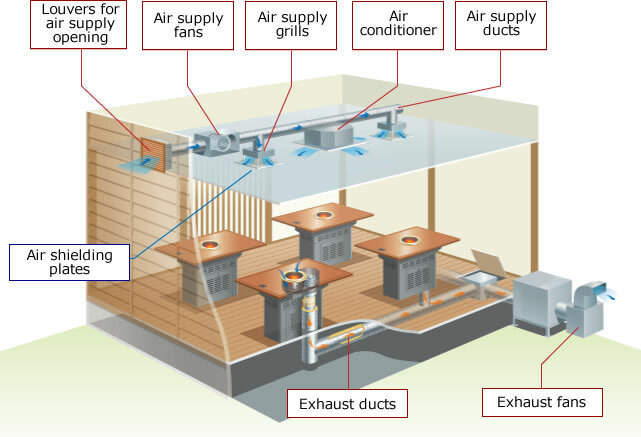 We offer duct systems with outstanding energy-saving performance, safety, and efficiency.